Please Note: This functionality has changed in 2018. The post below is old/archived. Love Google Drive but concerned about privacy since you have iPads shared by multiple students throughout the day or week? 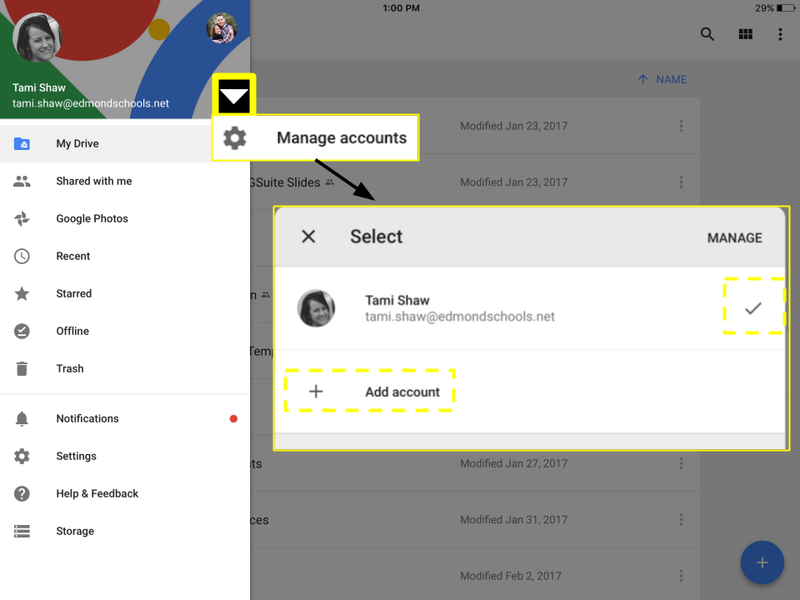 Have students set a passcode within the Google Drive apps to keep their account and files safe and private! NOTE: This is not the same as adding a passcode to access the iPad tablet itself. Once the passcode is set, the user will be prompted to enter it every time they want to access any Drive app! 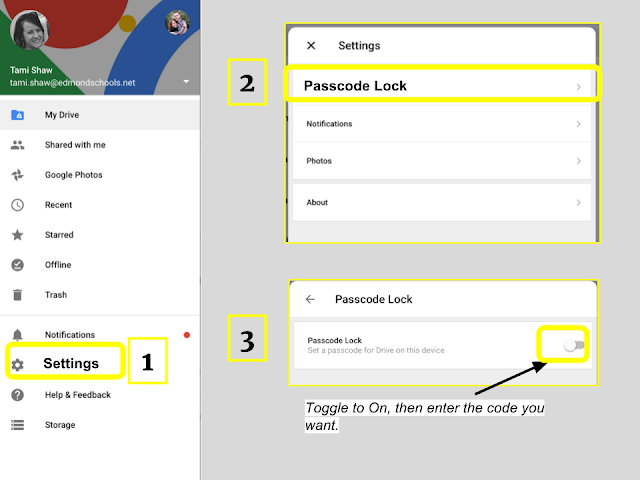 NOTE: This works for Docs, Sheets, Slides, etc., but, you cannot currently passcode-protect Google Classroom app access, Gmail, or other non-Drive apps. It’s easy to oscillate between accounts. The down-arrow will then reveal a list of all the Google Drive accounts currently added to the iPad. Once each account is passcode-protected (set by each individual student), then the user will only be able to open his/her own account. The same group of students uses iPads throughout the day (e.g. time blocks, class periods, or a cart shared by your grade-level team). You use a roster system, so each student is assigned a specific iPad number. (This minimizes the number of students accessing a single iPad, since they get the same one each day.) If the students who use iPad #5 add their Google Drive account and passcode-protect it, then their account is easily accessible when needed but still private to them. Constructive Struggleis my favorite phrase in education. Consider the two words independently then in conjunction: constructive, struggle. "Constructive" means the "struggle" is valuable. It's worth the discomfort, the pain, the time. This is easy to understand in the context of physical fitness and health. Exercising (struggle!) and making smart food/drink choices (struggle!) result in weight loss, health, and long-life (constructive!). Similarly, deep thinking (struggle! ), questioning (struggle! ), and making mistakes (struggle! ), all help us own and deepen our learning (constructive!). I continuously return to these videos for my personal growth in public speaking. They include inspiration, insight, and ideas. 10 Ways To Have A Better Conversation - Celeste Headlee (10:45) My all-time favorite TED Talk.